Naftali Bennett: Livni has reached 'rock-bottom' after she allegedly asked US to veto PA UN bid for the sake of the Left in elections. Jewish Home Chairman and Economics Minister Naftali Bennett sharply criticized former Justice Minister Tzipi Livni on Saturday night, after diplomats from the EU and US told Foreign Policy magazine that she appealed to John Kerry to stall a Palestinian Authority (PA) UN draft resolution solely to prevent Bennett and Prime Minister Binyamin Netanyahu from winning more votes in the upcoming elections. 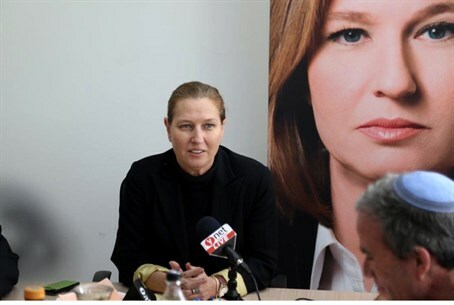 "Tzipi Livni has hit rock-bottom in political subversion," Bennett stated, "by going behind the back of the sitting government to help schedule operations that will harm Israel and doing everything to hurt Bibi / Bennett." "With all due respect, Livni's interests do not come before the state's interests, and demanding that an attack on Israel fit her schedule crosses a red line," he continued. "According to Livni, Israel is a country that must always apologize, governed by political interests." "I look forward to opposition leader [and Labor head - ed.] MK Yitzhak Herzog - whose intentions I sincerely appreciate - disciplining Tzipi Livni, who over the past few days has abandoned the state entirely and contributed to an atmosphere of incitement, and who is anarchic and dangerous to his campaign." Other MKs and political parties have also begun reacting to the news, expressing considerable outrage over what many see as a step out of line for Livni. Livni was sacked as Justice Minister several weeks ago after she repeatedly made statements against Netanyahu, even after being personally rebuked. "This shows that the sole interest of Livni and Herzog is to replace Prime Minister Binyamin Netanyahu, who was a bulwark against the [international] dictates and Palestinian pressure," the Likud party stated in an official statement Saturday night. It added that the two are willing to make "dangerous withdrawals" and "fold to international pressure." "This election campaign has crossed all red lines," Likud MK Ofir Akunis stated Saturday night. "Ms. Livni failed in negotiations with the Palestinians, [which] have been going on for years, and now gives advice to [the] American foreign minister, only to promote her personal political interests." "This is further proof that Livni and Herzog prefer to advance their political interests over Israel's national interests, and they are dangerous to Israel," he added. MK Ayelet Shaked (Jewish Home) wrote on Facebook that the move amounted to "Leftist subversion." "They asked to postpone an ambush on Israel not because it is not good for the country, but because it is not good for the Left in the elections," Shaked fired. "This is unprecedented." "Livni forgot she was supposed to represent the interests of Israel and is working all the time to please the worst of our enemies," Deputy Education Minister Avi Wortzman (Jewish Home) said. "This proves the miserable state of the nation and Livni has proved time and again that she is not ready, to say the least, to play a meaningful role. If she gives in to the world now, it is terrible to think about how she would act in more extreme situations." "Tzipi Livni is a model of relentless subversion for [the] 2015 [elections]," former Yesha Council Chairman and Jewish Home primaries candidate Dani Dayan stated. "The behavior of Tzipi - who was my camper in [the] Beitar [youth group - ed.] - and who is the daughter of two brave Irgun fighters, proves not only that she has switched political parties, but has also replaced her essence, just to please the Americans and political partners."